One loaded with kale, apple, sprouts, carrot, chia seed gel and Sun Warrior protein powder. The other with hemp protein powder, spinach, sunflower shoots, carrot and frozen banana chunks. My quick lunch smoothie left plenty of time during my break to run to the mall to do a little shopping for this weekend’s foodie gift exchange. Smoothies are my way of squashing a possibly oncoming cold. Also continuing with my regular workout schedule since exercise can help prevent and shorten the life of colds. Still, after enduring my annoying throat all day, I was craving something salty and greasy for dinner. 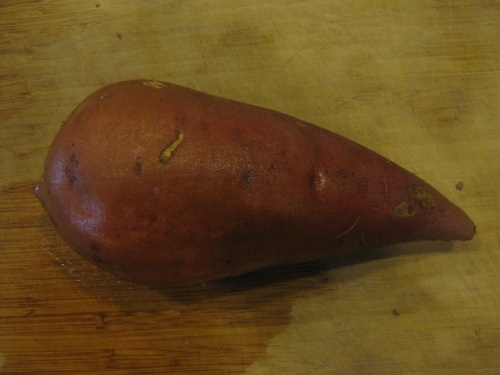 I busted out an ingredient that I haven’t worked with in ages – sweet potato. I don’t know why, they’re amazing, but I hardly ever buy then. Possibly because they usually take more time to cook than I have. But I was feeling adventurous on my last Whole Foods trip because I’ve been meaning to try something. 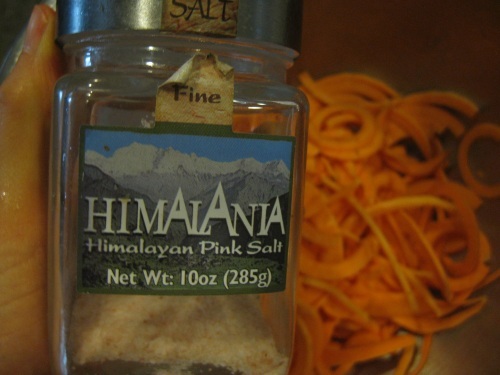 Spiralizing it for crunchy, shoe-string fries. But this was no easy task! 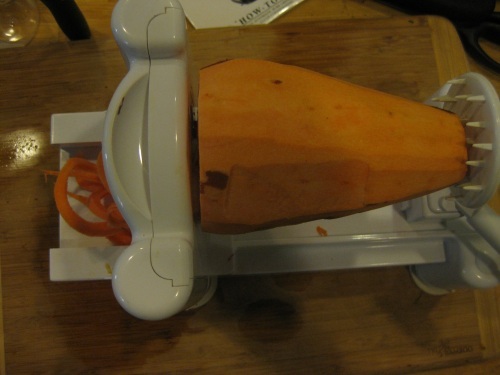 The plastic “teeth” on my spiralizer could barely get a grip in the tough potato and it required a lot force. Heck, it was practically a workout in itself! 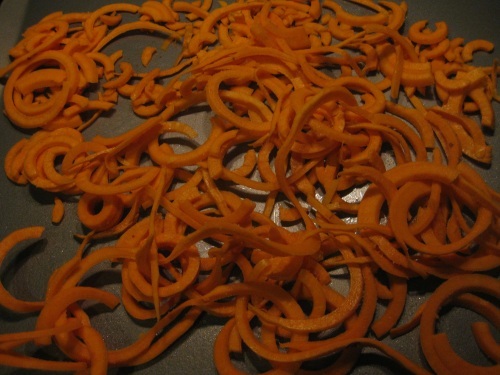 And the spiralized results weren’t exactly uniform, or even pretty. But I proceeded to toss them in a bowl with a tbsp. of coconut oil and liberal use of salt. Then I spread the “noodles” and noodle bits on a lightly greased baking sheet and baked at 400 degrees for 25 minutes. Well, they came out half crunchy and half mushy. Not the exact results I was looking for, but they tasted amazing with my tempeh salad leftovers from last night. Oh, my, goodness. I must try these! I make baked fries & I get a crispy texture by spreading them out evenly on cooking-spray coated aluminum foil and baking at 400 for 30-40 minutes, flipping once. I love the idea of this!!! 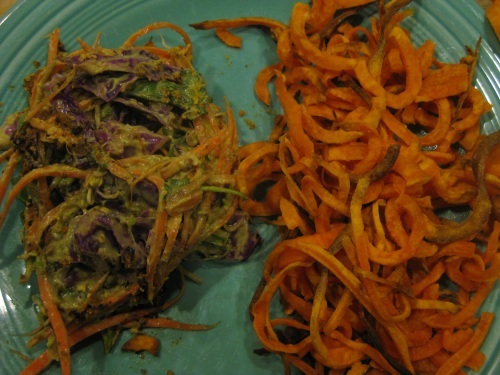 I used my spiralizer just yesterday, and now I want to try this too! 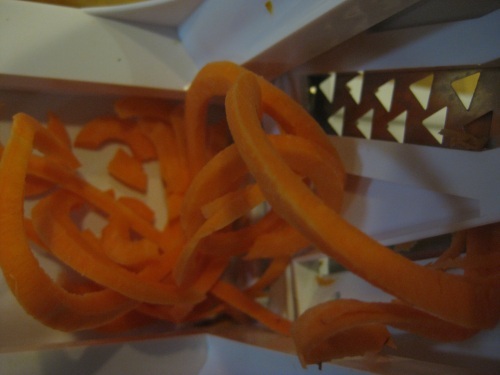 Isn’t the spiralizer the best. I love making all different creations with it! Love the sweet potato idea!